Thomas Cary Stinson and Mary Alice Fortune are my husbands gg-grandparents. I hadn’t worked on this line in several years and I just discovered your book and website this weekend. The book arrived today and I can’t wait to read it all! 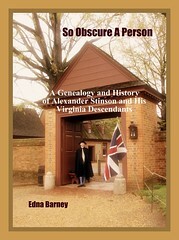 We have had the hardest time proving Thomas Cary Stinson and his brother Wesley were from Buckingham County and descended from Alexander despite alot of circumstancial evidence. I am so glad you were able to include them in your book. Wesley’s wife Laura is Mary Alice Fortune’s sister. I have dates, children’s names, etc. if you want them. Thanks for all your hard work!! 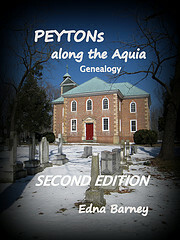 Nancy, thanks for purchasing my book. I have not come across documentation for the maiden name of Mary Alice, wife of Thomas Cary STINSON, nor of Laura who you say is her sister. Do you happen to know where that documentation is from? I was the one to ask this question. Thomas and Mary Alice are my great-great grandparents. Mary Alice’s surname and marriage are, I believe, found in a book called The Sanders Saga by Catherine McConnell. I have names and dates pertaining to her children and some family pictures, too. BTW, I am your facebook friend and enjoy your posts! I was the one who posted about going to see King Lear about the time you did. PS: Thank you for posting this!